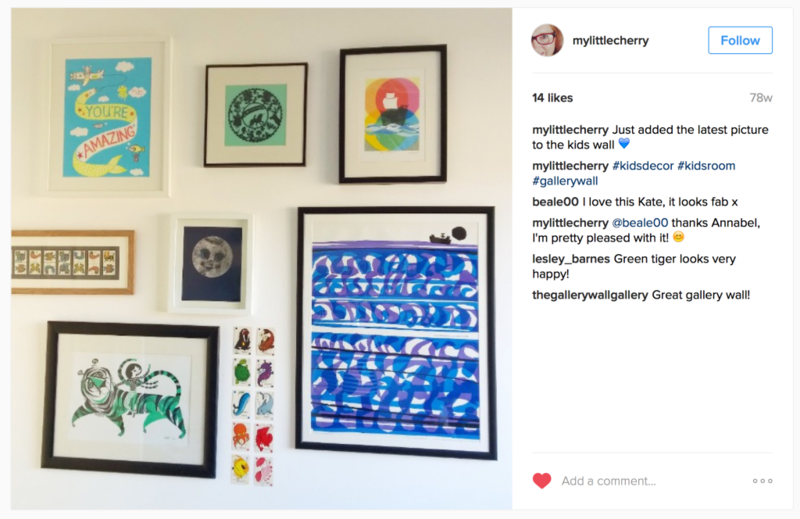 So you bought a piece of artwork that you love, yay! Now what? Yep. As printmakers and sellers we get these questions on daily basis from our online shops and in person at craft & art fairs. If you are wholly unfamiliar with the elements of framing prints and artwork it can seem like a math puzzle with multiple sets of numbers to keep straight. But really? It’s simple, we promise. And to prove it, I’ve broken down the main elements in the below diagrams that I illustrated for you. Ta-da! Artwork: The print, water color painting, vintage wallpaper, etc. that you want to display. This will be the smallest element in size. 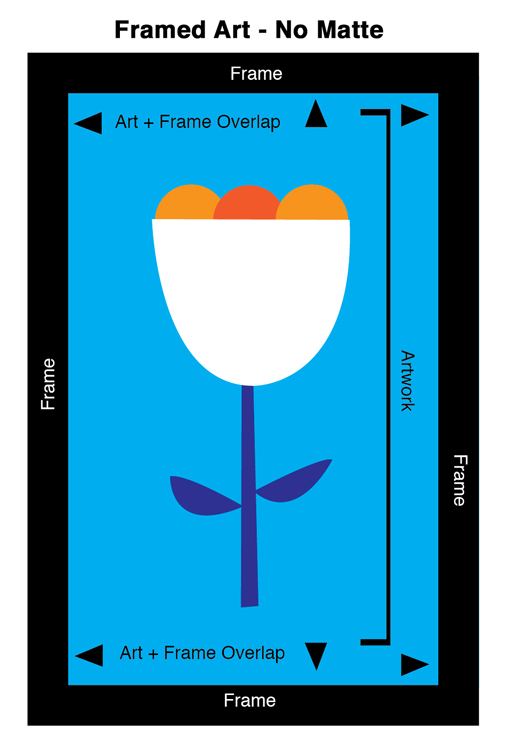 Shown here as my illustration of a tulip, including the entire artwork area. Matte: A thick paperboard “frame” with an opening where your artwork will be centered. 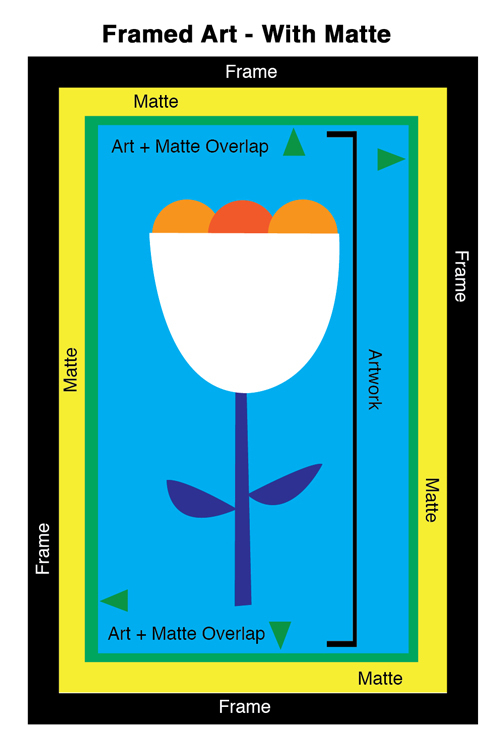 Mattes can be any color (white or black are the most common), any width, and you can even “double matte” (or triple matte if you are feeling ultra fancy) artwork by layering 2 different sized mattes over one another and over your artwork to be framed. Your matte will be longer and wider than your artwork at it’s outer dimensions, but the inside opening will cover the edges of your artwork (the green areas as above) for a seamless fit. The matte doesn’t have to cover your artwork uniformly, it just needs to lay over the edges so that your artwork is centered in the matte’s opening. Frame: The frame that you choose, yep, it’s pretty self-explanatory. But like mattes, frames come in many sizes, but also in a wide variety of materials such as metal and wood, and in practically any color and finish that you can imagine. The frame will be your largest sized element, and like the matte goes over the edges of your artwork? Your frame will go over the outer edges of your matte (which in turn are over the outer edges of your artwork). Framing is basically a layering game! However, note that a matte can be an optional element of your framed art, depending on your style and the artwork itself. Above you see a my diagram of the same artwork in a frame, but without a matte. To illustrate that difference further below are two examples of our Ghost Ship By Day Print framed, one with and one without a matte. Create-A-Frame, in Mt. Lebanon, PA.
We adore three places online that have great frames and mattes and both places offer all American Made materials, plus all frames and mattes are cut to your specs, which is amazing and really great. They all ship quickly and safely. All very affordably! Frame USA – Our favorite online go-to! No really. For DIY framing or bulk frames, and super specific specs and variety Frame USA is the tops. All of their materials and frames are made here in the USA, featuring an incredible selection of reclaimed and first-use wood, metal, and composite frames in a huge array of color options, including mattes and accessories from super affordable to super high end. They make framing projects so easy. All Barn Wood – many of their frames have a more rustic and camp vibe with lots of reclaimed wood options. Matteboard And More – offers custom size, color, and material options in mattes, backing boards, frames and show kits and more. There are of course off great off the shelf options these days now too at places like IKEA, Target, Bed Bath & Beyond also where frames usually come with a matte included. If you are going that route, we suggest that you find a frame that you like, and then get a matte custom cut to your artwork’s size for about $10 at places like Michael’s & JoAnn’s craft stores, or at your local favorite framery (see ours above) or art supply shop. So there you go! If you have any questions feel free to comment below. We hope that this post helps you get you new artwork up & beautifully displayed.